In addition to Terraform already being integrated to the Azure Cloud Shell, I’m pleased to announce the availability of the new Terraform solution in the Azure Marketplace. This solution will enable teams to use shared identity, using Managed Service Identity (MSI), and shared state using Azure Storage. These features will allow you to use a consistent hosted instance of Terraform for DevOps Automation and production scenarios. The Terraform solution configures Terraform to use Azure Storage instead of the local file system for Terraform state. This remote state implementation will lock state when one user is changing it, to allow multiple users to consistently change the state of shared environments, such as production. The template also configures a Managed Service Identity and provides a Role Based Access Control (RBAC) script that will allow this identity to provision resources in the Azure subscription using Terraform. This eliminates the need for managing Service Principal secrets for Terraform separately in automation scenarios such as continuous deployment with Jenkins. Development on the Terraform Azure Provider also continues at a furious pace, we passed the 1.0 milestone last December, and version 1.3 has already shipped. As we near complete coverage of our core infrastructure services such as Virtual Machines, Managed Disk, and Networking among others, you can expect to see further development to support our platform services as well as more advanced deployment scenarios. Microsoft and HashiCorp engineering teams continue to develop the Azure Terraform provider and modules with the Terraform community. If you want to raise feature requests, issues, or even contribute yourself, then please join us in the AzureRM GitHub repository. As we continue to enhance Terraform support for Azure, we’re seeing significant adoption of Terraform by Azure customers, in the last year alone we’ve seen an over 4x increase in the number of our customers using Terraform. 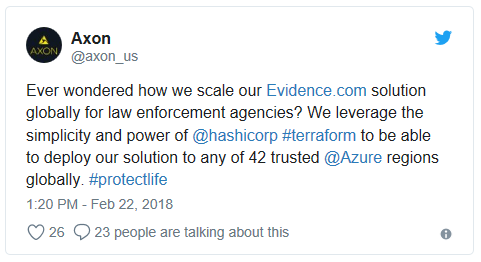 Axon is one such customer, leveraging Terraform to scale their Evidence.com solution on Azure. In fact, Azure customers across a wide range of industries are leveraging Terraform for similar benefits. I’m excited about the improvements we’re making for Terraform users on Azure. 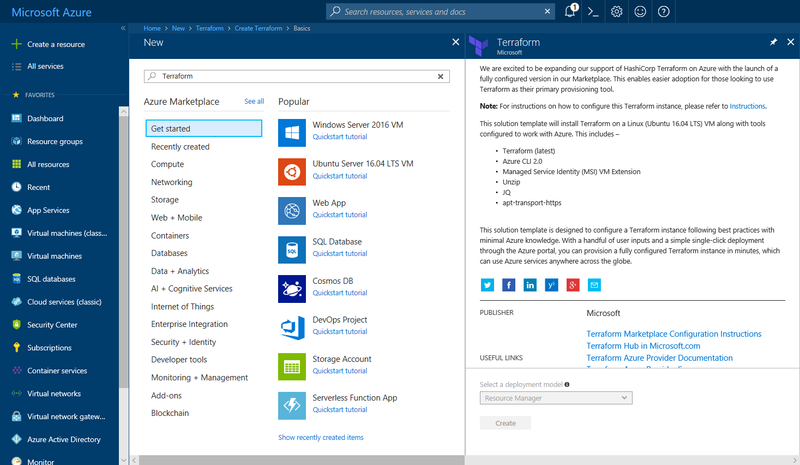 Go ahead and try the new Terraform Solution in the Azure Marketplace or learn more in the Terraform documentation hub.